After leaving work, I headed over to Bunche Beach again to try to add to my July List in this final day. Not far from the work a 200 plus acre property was being denuded to prep it for a new research park by Florida Gulf Coast University. It is ironic that all this forest was being destroyed to create a research center dedicated to advancing GREEN technology. The property was infested with mealaluca trees, which is a serious pest in south Florida, yet I have seen many white-tailed deer, wild turkeys, bobcats and wild hogs use the property over the almost ten years I have been using this road. The developers did remove mealaluca and Brazilian pepper from wetlands that could not be developed. But there is a plus, though only temporary. The now muddied fields have the potential as an attraction for migrating shorebirds like pectoral sandpipers, yellowlegs and peeps. A check this morning reveled the usual Killdeers and Boat-tailed Grackles, plus a Spotted Sandpiper. Hopefully we can see more activity later. At the beach the tide was just right and the beach was active with large numbers of feeding Sanderlings, Semipalmated Plovers, Wilson's Plovers and Short-billed Dowitchers.. All the usual waders are on-hand, plus a couple of American Oystercatchers, several Marbled Godwits, Willets. Also seen were several Western and Least Sandpipers and first-of-season, unbanded Piping Plover. Had several Laughing Gulls, Sandwich Terns, Royal Terns, Least Terns a sole Black Skimmer. Saw only one Brown Pelican and a single DC Cormorant. A beautiful Bald Eagle soared overhead and a lone Roseate Spoonbill was feeding in the south channel. The mud flats to the north were also loaded with many more avian, but a scope was needed. I plan on returning tomorrow morning to start my August list. Also planning on a return trip to the Everglades Ag Area in mid-August to seek out the upland sandpiper. At the conclusion of a safety meeting for work, I was heading for home, but made a brief stop at Six-Mile Cypress Slough boardwalk. Arrived about 8:30am with the idea to seek out the black-and-white warbler and red-eyed vireo that was located here last Sunday. It was not very birdy and I did not find the warbler or the vireo. But I was a bit surprised to find a lone female American Redstart in the company of a pair of Blue-gray Gnatcatchers. Seemed a bit early for redstarts, but a few do winter in the very south end of Florida. As I was trying to relocate the redstart a flash of gold fly past me and landed on a branch just a few feet from me. Sitting in plain sight was a beautiful male Prothonatary Warbler. That was about the extent of the birds here for my day. Did have a have a Hairy Woodpecker, Red-bellied Woodpecker and heard a Pileated Woodpecker. Also seen and heard were Carolina Wrens. But the warblers were a great addition to the summers scant list of warbler species seen so far. Tuesday morning, my daughter and I headed out at day break to check a new area for us. We were going over toward Palm Beach County and the Everglades Agricultural Area south of Belle Glade and South Bay, to look for newly arriving shorebirds, terns and swallows. Late summer is the time to check the flooded fields and sod farms. It was a little early yet, but reports were starting to show up on the message boards. Our goal was Brown's farm Road south of Belle Glade. The one problem with venturing to a new area, cold so to speak, is that you can waste a lot of time and energy, that those experienced on the site would avoid. So for us that was the case. A good day but not too much that I could not have found near home. No doubt our inexperience, here, was our problem. we missed on almost all of the species we were looking for. We started with a quick stop in Alva and got Wood Duck, Red-headed Woodpecker, Loggerhead Shrike, Northern Mockingbird, Eastern Meadowlark, all because I already knew were to look. Next I wanted to check out a good site off US29 in Gladys County to look for scrub jays and wild turkeys. But the US29 bridge over the Caloosahatchee River was closed for repairs. Took an alternative route which added time. A waste of time. No jays or turkeys. Did get Black Vulture, Swallow-tailed Kite, Red-shouldered Hawk, Crested Caracara, Sandhill Crane, American Crow, Eastern Towhee, and Eastern Meadowlark. Found two caracaras with one being harassed by a towhee. Had four swallow-tailed kites. The crows appeared very scruffy as they were experiencing a molt. Continued on eastward on Rt 80/US27 toward Clewiston. Between Moore Haven and Clewiston, had to have seen sixty swallow-tailed kites including a kettle of about twenty birds. Next checked out Griffin Road west of Clewiston were we found several Common Nighthawks resting on the wires, plus a pair of Gray Kingbirds and a lone Barn Swallow. Later at the picnic area were bronzed cowbirds were found last winter, by the Lake Okeechobee boat ramp we found a couple of Cormorants, Laughing Gulls and a lot of Boat-tailed Grackles. Was hoping to find the eastern kingbirds I found here a few weeks ago, but not today. In town were the usual Rock Pigeons and House Sparrows. There is a cypress stand located off of US27 and along the Miami Canal on RT827 that is noted for roosting barn owls. This is one of my nemeses birds and that status was maintained, after driving this narrow lane miles through the sugar cane fields to the location. Did spot several more resting nighthawks, soaring swallow-tailed kites and wading birds in the adjacent ditches, but we did not see any owls. They were probably there, I just could not spot any birds at all in the stand. From here we found the Brown's Farm Road and traveled south 14 miles till it turned to a gravel road and as it was already past our time to head back home. We turned around here. Needed to arrive earlier to more thoroughly explore the area as we obviously missed the reported flooded fields. We did find small flocks of resting Purple Martins and Bank Swallows, and at a flooded area along some high-power lines we found a few Black-necked Stilts and a few waders. But not the long list of reported sandpipers, dowitchers and whistling ducks. Nor any black or gull-billed terns at the sod farms along US27. Thought I had king rail out in the open, but it was really a juvenile Green Heron in a hunkered down postion. Also had a juvenile Red-tailed Hawk. Did find a large number of Wood Storks, White Ibis, Great Egrets and such concentrating on a particular ditch in one of the sod farms. Had to have been a close to a hundred birds. Monday, July 26th, I headed over Babcock-Webb WMA in Charlotte County to see what is happening there. I got there a bit late to catch the Red-Cockated Woodpeckers as they exited there nest holes at sunrise. Only was able to hear a couple of them calling as they were heading away from the colony site. Spent about four hours driving and walking the roads looking for the specialities of the red-cockated woodpecker, the Bachman's Sparrow and brown-headed nuthatch. Besides the brief experience with woodpeckers I was only able to find a single singing Bachman's Sparrow. Most common bird of the day were probably the Eastern Meadowlarks, Red-Winged Blackbirds, Eastern Towhees and Northern Cardinals. Came across several juvenile birds that identification a bit more interesting such as a couple of towhees, several Eastern Bluebirds and Pine Warblers. Came across a few Common Nighthawks working the wooded areas. Was able to photograph a Northern Bobwhite walking along a road. The best bird of the day was my last. As I was making a last pass along Oil Well Road I found a my first-of-season Black-and White Warbler working a pine tree. I don't recall ever seeing a black-and-white at Babcock-Webb before. This weekend I headed over to Bunche Beach three times. My visits on Friday and Saturday were spurred on by the possible appearances of pelagics due to Tropical Storm Bonnie passing close by as it entered the Gulf Of Mexico. The good news was that the storm was really a dud as far as tropical weather is concerned, so zero damage, but we needed the rain fall. The bad news was that the storm was a dud and no pelagics. On Friday evening as the rain was petering out as I headed out to the beach. I was greeted at the north end of John Morris Road with a brief fly-by of a FOS Belted Kingfisher. The tide was rising and lots of birds were still present. We had a lot of Short-billed Dowitchers many still in alternate plumage, plus Sanderlings and Willets. The migration is on. Also present were a handful of Least Terns, which will be heading out to sea soon, a lone Royal Tern and a couple of Sandwich Terns. First-of-season Barn Swallows were working the beach. A pair of Spotted Sandpipers, still in alternate plumage, were working the east end of the beach. Saw no plovers at all. Earlier that morning I checked out the Monk Parakeets and Burrowing Owls at Pelican Boulevard Ballfields in Cape Coral. Also found a lone Swallow-tailed Kite soaring over Ft Myers. Haven't seen many of the kites this season. On Saturday morning returned for another try for pelagics. Had a repeat of Friday's visit. No pelagics, but a beautiful Forester's Tern flew in, in its alternate plumage. The only plover seen was a Black-Bellied Plover. Sunday evening, at 6pm, was the Lee County Bird Patrol Bunche Beach Bird Walk. We had about fourteen participates and a very low tide. A very good variety and a scope was very handy as the birds get spread out across the mud flats. Finally had plovers on hand - Wilson's, Semipalmated and Black-Bellied. Still missing are piping plovers. One of our co-leaders today was Charley Ewell, who was quite knowledgeable on shorebirds. He gave excellent lessons on identification and life-cycles for many of the birds present. He spotted and identified the first Western and Least Sandpipers we've seen this season. And instead of finding barn swallows we had a small flock of Purple Martins. The hundreds of fiddler crabs busy on the beach by the mangroves were very popular with many of the participants. You did have to watch your steps. It was a very good event today. Earlier in mourning I checked the I-75 rest stop area for any shorebirds and came up with nothing, but did run into Bob Pelkey, who was looking to photograph any of the Black-Necked Stilts I had previously reported on. Before I left, I pointed Bob to the best area to look for the stilts, which he later reported that he was able to photograph. He had ten stilts later in the morning. Tried checking out the Rest Stop at I-75 and Daniels Road again this morning looking for migrants shore birds. Found several Glossy Ibis, a few Killdeer and Mottled Ducks. A trio of Black-Necked Stilts flew in and a pair of Lesser Yellowlegs were seen in the company of a, first-of-season, Greater Yellowlegs. Returned to Domestic Street were things are a bit slow. Only found a single Burrowing Owl setting atop a low bush, had dozens of Mourning Doves, a couple of Loggerhead Shrikes and Northern Mockingbirds and heard an Eastern Meadowlark. Only a Great Egret on the ponds. The best hit was being able to get a fair photo of a calling Northern Bobwhite sitting atop a fence post. With Tropical Storm Bonnie passing close by tomorrow a visit to Bunche Beach could be in order to see if any pelagic birds are pushed into shore. The Lee County Bird Patrol is hosting a bird walk at Bunche Beach this Sunday at 6pm as well. I am planning on attending. May try Babcock-Webb WMA on Monday or Tuesday in the early morning. Too hot to bird there later in the day. Not too much birding these past few days. We have been preoccupied with my oldest moving out with his wife to their new home in Washington DC. She begins classes in law school there next month and they have a lot to do. While loading the rental truck Friday we had a pleasant surprise with a pair of Swallow-Tailed Kites soaring overhead. Beautiful birds. But seems to me that I haven't seen as many as usual this season, which should be ending in two or tree weeks. Another surprise occurred as we made our good byes as a white-morphed Short-Tailed Hawk was seen soaring over-head. Hadn't seen one these Florida specialities for several months. Another nice sighting without having to go anywhere. Earlier yesterday morning, just before leaving work, I noticed a pair of Common Nighthawks working the area with one bird surprising me with a swoop just four feet over my head. They too, should be gone by the end of August, when they head south to Central America. Following work I did check out the flooded fields at the I-75 rest stop to see if any new shorebirds were on hand. Did find four Black-Necked Stilts and four Killdeers. Four Glossy Ibis came flying in. Next checked out the Domestic Street site were a large flock of White Ibis, Roseate Spoonbills, Great Egrets and Snowy Egrets are taking to the air. Could not locate any of the burrowing owl family, which maybe dispersing, but did find a Red-Tailed Hawk sitting atop a high-power line stanchion. The pair of Barred Owls that are visiting my workplace overnight have been making a very curious call or whistle. Usually when we have barred owls on site, it is only a lone individual and rarely make any kind of noise. But this season we have a pair and they are making a call that reminds me of a very low volume whistle that starts out low and rises in pitch. It reminds me of a sliding whistle. I had been hearing this noise over several days and did not know were it was coming from. Did not suspect that it was coming from a bird. 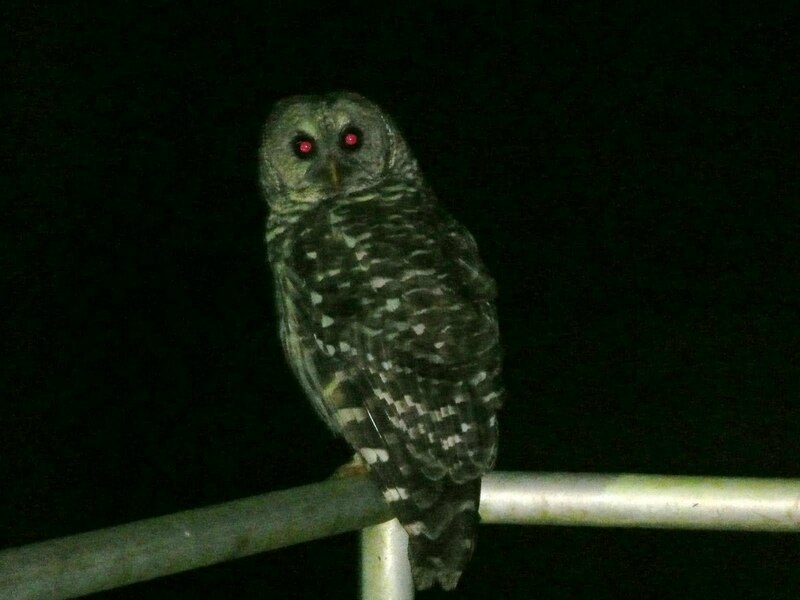 I was looking around the plant for the source, as a concern that we were having some kind of mechanical problem until the other night, I was just ten feet from one of the perched birds, who lowered its head and made the call. My suspicion is that it could be some kind of vocalization between a parent and its offspring. Need to do some research and any help would be welcome. After reading several reports of Black Terns at Gundy Beach, near St Petersburg and of Gull-Billed Terns at a mitigation impoundment on Cockroach bay Road, near Ruskin, I planned stops at these locations on my trip up to Tampa Bay today. My original plans were to check out Lettuce Lake Park in Tampa as well as visit my daughter who has recently moved up that way. So we had a full day ahead. My younger daughter, Katie, and I head out early making the first stop at the Ruskin location. And just as reported, at the first impoundment encountered we did find four active Gull-Billed Terns working the pond. A LIFER!! I don't know why, but one of my favorite birds are the little Black Terns. I first encountered a few as they made there brief stops at Bunche Beach around Labor Day on their fall migrations the past couple of years. We see them in there more drab plumage. Last year I was successful in briefing seeing a fly-over of a pair of Black Terns in breeding plumage, while visiting in northern Illinois. This afternoon, I was able to see, from a distance at Gandy Beach (a part of the Gandy Road Causeway), at least three in breeding plumage. A couple of others were seen to have molted already. Unfortunately, all the black plumage birds were scared off by beach traffic and did not return. So no useful photos. Other terns seen included Least Terns, Royal Terns, Sandwich Terns and Black Skimmers. Brown Pelicans, Laughing Gulls and a Willet were also present. Dolphins too. So far, for July, I have hit hit most of my usual sites - Bunche Beach, Alva, Six-Mile Cypress Slough, Harne's Marsh and the fields and ponds along Domestic Street. To this date I have a count of 79 species for the month. Yesterday I had planned on attending the Audubon of Southwest Florida's Urban Birding Event in downtown Ft Myers. It was supposed to be about the Purple Martins that roost down by the river, but they aren't here yet. The Purple Martins that I had reported on a couple of weeks have disappeared as well. I did not go to the event however because of thunderstorm over downtown at the time and because of an invitation from Bob Pelkey to hit Bunche Beach. I did meet up with Bob who was seating half-submerged working on his photography of the birdlife at the beach. As the sun was setting, Bob was waiting on the arrival of Black Skimmers and Black-Crowned Night-Herons, which arrived right on cue. Other species seen included Wilson's and Semipalmated Plovers. A couple of Black-Bellied Plovers, about four Least Terns, a lone Brown Pelican, a few Sanderlings, a single Magnificent Frigatebird, Willets, Marbled Godwits, Short-Billed Dowitchers, an immature Bald Eagle and the usual waders. I had also checked out Bunche Beach back on Friday the 2nd of July while I had time to burn waiting for my daughter to finish up so business at school. Wish I had brought along a camera. Because I had the good luck to find the Long-Billed Curlew that had just been recently reported on here. The tide was conducive for birding and it was evident that the shorebird migration was underway. Lots of Marble Godwit, Willets, Short-Billed Dowitchers. A fly over Roseate Spoonbill was seen as well as five American Oystercatchers. Singing Prairie Warblers and Northern Cardinals were present and a family of Muscovy Ducks were seen by the roadside near the John Morris Road entrance. Plus all the usual waders. But no peeps yet. On the Fourth, I checked out Six-Mile Cypress Slough in the afternoon, in between rain storms. Not much happening here. A couple of Anhingas and Great Egrets on the lake. Blue-Gray Gnatcatchers and a Carolina Wren along the boardwalk. On the fifth I checked out Harnes Marsh and Alva. Only found a single Snail Kite at Harnes Marsh, but did come across at least ten Limpkins including a family with two chicks. Also seen were Pied-Billed Grebes, Mottled Ducks, an Osprey, lots of Boat-tail Grackles and a few waders. At Alva I found Red-headed Woodpecker, Wood Ducks, Loggerhead Shrikes, Crested Caracara, White-Winged Dove, Chimney Swift, American Crows and Swallow-Tailed Kite. Later, again on the tenth, I located a pair of Gray Kingbirds preening and hawking on the wires along Estero Blvd on Bonita Beach. Other sitings in and around my work place have included Barred Owls, Red-Shouldered Hawks, a White-Eyed Vireo, Fish Crows, Black-Bellied Whistling Ducks, lots of grackles, Cattle Egrets, Cardinals, Red-Bellied Woodpeckers, Mockingbirds, Loggerhead Shrikes, Eastern Bluebirds, Green Herons, Pine Warblers and Blue Jays. On the barred owls, we have had a pair of the owls hanging out at the plant most evening these days, but one recent night there was a trio. Seemed unusual. The Common Nighthawk has not been heard from very often lately. They usually disappear by the end of August. Closer to home, on Domestic Street, the Burrowing Owl family has fledged. Came across a couple of the young owls sitting on hydrants and fence post with one of the adults keeping watch from the overhead power line. Can not say that I had ever seem a burrowing owl sitting on the wires before. Other birds found here have included Chimney Swifts, Eastern Meadowlarks, a calling Northern Bobwhite. Mockingbirds, Grackles and Loggerhead Shrikes. Plus Mourning Doves and Fish Crows. Not much on the ponds these days. The purple martins have moved along as well.